In September of 2009, the Bureau of Land Management (BLM) removed an entire sub‐population of wild horses from the Custer National Forest lands in the Pryor Mountains. 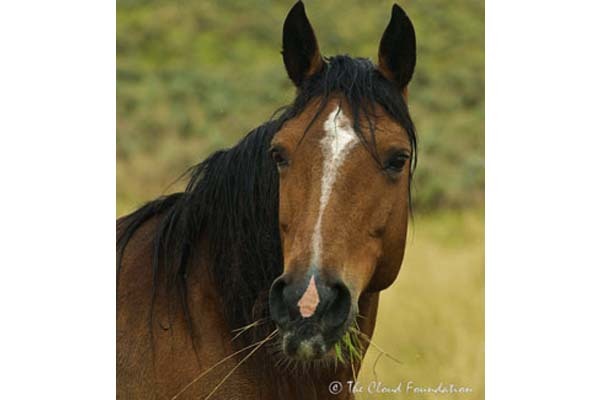 The older horses in four family bands were acquired by the Cloud Foundation (TCF) to prevent the horses from being permanently penned in feedlot style facilities, and to prevent the family bands from being separated and the stallions gelded. 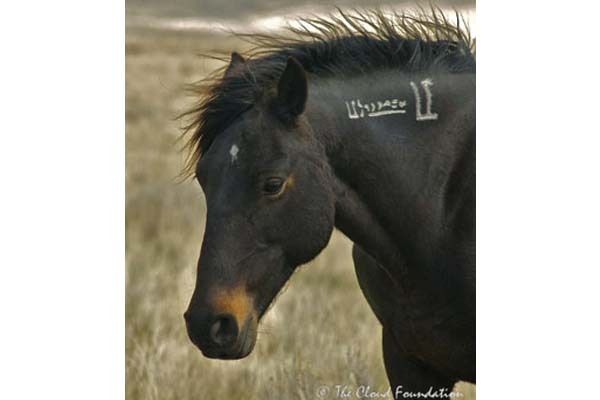 TCF also acquired the horses as a genetic reservoir for the main Pryor herd, which is a small, isolated herd in danger of suffering irreparable genetic loss. The Freedom Family horses or their offspring could be released back into the Pryors to rejuvenate the main herd if needed. Conquistador, one of our four band stallions, died suddenly in May 2012, perhaps from a lightning strike. In June of 2014, one of our other band stallions Shane died, and it is believed his death was lightning related as well. Read more in "A Tribute to Shane." Two bands led by Trigger and his son Pistol remain. 12 horses are in our care and they live on pastures leased by TCF north of Livingston, Montana. The horses owned by the Foundation are representative of the small but sturdy, Spanish‐style horses of the Pryor Mountains, one of the only Spanish Colonial herds remaining in the West. They include the flashy bay stallion, Trigger (first documented by Ginger Kathrens as a newborn for the 1997 BBC production “Spirit of the Mustang”), his mares Evita and Moshi, Sierra, Mystery, Josie (daughter of Trigger and Mae West), and Moshi’s older daughter, Chaulupa. At the moment, Pistol (born in 2010, son of Trigger and Evita) has nearly all the mares. The mares who have reproduced are on the one‐year infertility drug PZP. The vaccine is reversible unless applied remotely five to seven years in a row. It is over 90% effective. Interested in sponsoring the Freedom Family? View our Freedom Family sponsorship opportunities by clicking below to visit our Donate page. Or you can donate now in memory of Grumpy Grulla, the remarkable Freedom Family mare. Born 1997, son of Flicka and the only offspring of the deceased grullo stallion, Challenger (who was struck and killed by lightening in 1999). Ginger Kathrens was hired by the BBC to document Trigger for the program, “Spirit of the Mustang.” when he was just a couple of days old. With his “hour glass” blaze and stockings, he was photogenic and unmistakable on the range. As a two-year old, he ended up in a two-stallion band led by the sabino stallion, Crazy Horse, and the stylish bay stallion, Star. Oddly, these stallions allowed 2 year-old Trigger to breed mares in the band, so Trigger had unusual early training! Crazy Horse and Star ranged widely, using the spring-fed waterhole atop isolated Tony Island in the Custer National Forest. Perhaps this is why Trigger chose to live in the National Forest lands as an adult. Trigger leaves no offspring on the range. Born 1999. Moshi is the grulla daughter of Quelle Couleur who lived in Grijala’s band in the Pryors. Moshi’s father is likely Lakota, a favorite of many of us. The 20 year-old grullo stallion was put down by the BLM in July, 2012 as a result of injuries sustained in fighting, likely while trying to win back his band from Grijala. Born 1998. 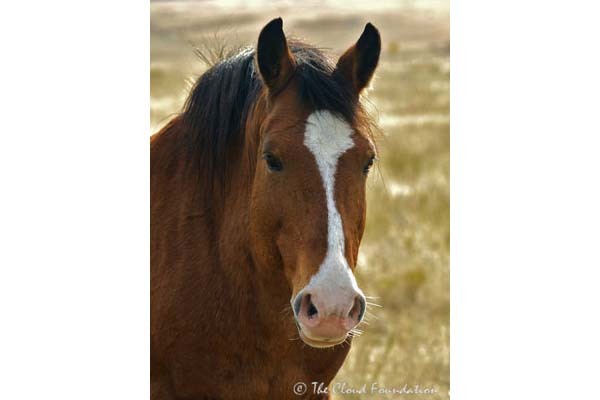 Mae West is likely the daughter of Froggie, one of the most mysterious of all the band stallions in the Pryor Mountains. He and his mares lived in Cougar Canyon and we never knew where they got water. I only saw him once before he raced away. Mae’s mother is the statuesque Belle Star, the full sister of Raven (Cloud’s father). Mae is the mother of Josie. Mae’s daughter, Freedom, is owned by Teresa Strickland and her family in Texas. Mae inherited her mother’s incredible eyes and passes them on to her elegant offspring. Born 2002. Chalupa is the daughter of Moshi and Santa Fe. Chalupa, a beautiful red bay, was with Bo’s band when she was captured. Chalupa and Bo produced two sons in our care. Diablo (Patriot) lives with the Strickland family in Texas. Her son, BJ (Bo Junior), lives on my ranch in Colorado. Chalupa is also the mother of Winter. Chalupa’s mother, Moshi, was with Santa Fe in 2001 but the band was shattered during the 2001 helicopter roundup and Chalupa was born into Pierre’s band. When I look at Chalupa’s beautiful face, I see the image of her father. Winter was born on the first day of winter, 2017. She is the daughter of Trigger and Chalupa. Although born in subzero temperatures, she is not only surviving but thriving. Born 1993. When I first saw Mystery she was a yearling and I asked Rev. Schweiger why she was named that and who her parents were. At that time, he said that her identity was a Mystery and that is what he called her. Mystery is the wildest of our horses and rejects any contact with us humans. I admire her tremendously. Sadly, she has no offspring on the wild horse range or in our care. Born 1996. Dark bay daughter of the sorrel mare with the flaxen mane and tail, Madonna, and probably the stallion, Looking Glass. Evita has such a sweet disposition, soft expression, and beautiful conformation, much like her stylish mother, Madonna. Evita also has the nurturing qualities of her mother. We regret she did not leave any offspring on the range but are thrilled to have her son, Pistol, in our care. Born 1988, Grumpy died on Christmas Day, 2017. We have no idea who her parents were. This remarkable mare shared lead mare duties with the smaller, claybank buckskin mare, Isabella. They were Raven’s mares when I first came to the Pryors in 1994. I named her Grumpy because she was a disciplinarian with the youngsters in Raven’s band, which in 1995 included the lively trio of foals, Mahogany, Smokey and Cloud. She only asked once and the foals knew she meant business. Grumpy aged well and we valued her senior wisdom. She and Mystery were good friends. Grumpy leaves her grulla daughter, Cedar, on the range in Hamlet’s band. Her granddaughter, Hitally, is with Morning Star and their daughter, Reverie. Born 2011. Lily is the dun daughter of Shane and Moshi and is almost a dead-ringer for her father. How Lily lost the very tip of her left ear remains a mystery but gives her a distinctive air. She has the sweet disposition of her half-sister, Chalupa. Since her porcupine incident and a visit to the vet, she is fairly fearless with visitors. Born August 2010. Pistol is the precocious bay son of Trigger and Evita. After the untimely death of Shane, Pistol stepped in to establish a band consisting of some of Shane’s mares. Born 1996. Daughter of the lilac roan mare, Princess. Sierra was born into the band led by the small, dark grullo stallion, Konik. Because of her chestnut color, it is unlikely he was her father. The band was being dogged by a red roan, stallion, the Rev. He might be her father. However, she resembles Flash, the sorrel stallion with a blaze face who lived to be 27 years-old. Sierra’s only living offspring was Fortunatus who died in the harsh winter of 2010-2011 probably as a result of the newly erected fence that prevented him from returning to his traditional wintering grounds in the Custer National Forest. Sierra has not produced a foal while in our care. Born 1999. The leggy daughter of the deceased black mare, Pocotello, and the black stallion, Pierre. After the death of both Conquistador and more recently Shane, Cavalitta is in Trigger’s band, although she maintains a level of independence that is intriguing to observe. Cavalitta and Conquistador leave three sons on the horse range, Grijala, Hernando and Garay. All three are band stallions on the Pryors, and are robust and taller than the average Pryor mustang, a characteristic that no doubt helped them in winning mares. Born 2011. Daughter of Trigger and Mae West. Josie was stolen from Trigger by Conquistador just weeks before he died. She and Cavalitta are fond of each other and just recently Moshi has shown her fondness for this colorful filly as well. Josie promises to become an outstanding mare. She is the great niece of Raven, Cloud’s father, and has her mother’s large and expressive eyes. Quite the beauty!